Actinic Keratosis, also known as solar keratosis, is the most common type of pre-cancer condition, affecting approximately 58 million Americans. Actinic Keratoses are precancerous skin cells. If not properly treated, they can develop into squamous cell carcinoma, a potentially fatal form of skin cancer. Actinic keratoses typically appear on areas frequently exposed to the sun’s ultraviolet rays: the face, ears, the back of hands, and an unprotected scalp. When they occur on the lips, they are called actinic cheilitis. Actinic keratoses start small and are often felt before being seen. They feel rough or crusty and scaly, and often resemble warts. They may be red, tan, pink, or flesh-toned. They range in size from about one-eighth to one-quarter of an inch or about the size of a pencil eraser. Because actinic keratoses typically develop over time, they are most common in patients over 40. However, they can occur in patients as young as teenagers. Those who fail to use sunscreen, or those who use tan accelerators and tanning beds, face a higher risk of developing actinic keratoses. Actinic keratoses may itch or produce a pricking or tender sensation. They can also become inflamed, and the surrounding skin may be red. Some actinic keratoses may bleed. The cause of actinic keratosis is sun damage from harmful UV radiation. If you have a fair complexion, blond or red hair, and blue, green or grey eyes, you are more susceptible to actinic keratosis. Men are at risk because they often spend more time in the sun, and tend to use less skin protection than women. African-Americans, Hispanics, Asians and others with darker complexions are less susceptible than caucasians. Any unusual marks on your skin should be examined by a doctor, such as Dr. Michalak, a board-certified cosmetic and dermatologic surgeon. Several treatment options are available. They include topical medications, surgery, and chemical peels. Medicated creams are very effective used alone or combined with other treatment options. Creams include 5-fluorouracil (5-FU), an FDA-approved topical agent widely used to treat actinic keratoses. Treatment involves rubbing the cream onto lesions once or twice a day for 2-4 weeks. Reddening, swelling, and crusting may occur but they are temporary. This treatment has produced cure rates up to 93 percent with rarely any scarring. Another FDA-approved agent, Imiquimod 5 percent cream, works by stimulating the immune system to produce interferon, a chemical that destroys cancerous and pre-cancerous cells. It is rubbed gently on lesions twice a week for 4-16 weeks. Some individuals may develop redness and ulcerations from this treatment method. Diclofenac is a non-steroidal anti-inflammatory drug used in combination with hyaluronic acid, a chemical found naturally in the body. The gel is applied twice daily for 2-3 months and works well for those who are oversensitive to other topical treatments. If you want faster results with a topical agent, the newest treatment cream is Ingenol mebutate, approved by the FDA in 2012. The gel is used in 0.015 percent or 0.05 percent doses. It is the first topical treatment that can effectively treat actinic keratoses in just 2-3 days. The 0.015 percent gel is applied to the face and scalp once a day for three consecutive days. The 0.05 percent gel is used on the trunk and extremities once a day for two consecutive days. Side effects include skin redness, flaking, scaling, crusting and swelling. Cryosurgery is the most common treatment used when the number of lesions is limited. Liquid nitrogen, applied as a spray or with a cotton-tipped applicator, freezes the growths. The lesions eventually shrink or become crusted and fall off. Common side effects are temporary redness and swelling. In some cases, white spots may be permanent. Chemical peeling, often used to reverse signs of aging, is also used to treat actinic keratoses. Trichloroacetic acid (TCA) or similar chemicals are applied directly to the skin. Surface skin layers slough off and new skin appears within seven days. This treatment requires a local anesthesia and can result in temporary discoloration and irritation. Laser surgery Seattle & Issaquah is a good option for lesions appearing in small or narrow areas. The laser is directed onto the lesion, allowing the beam to cut through tissue without bleeding. Laser surgery is often used on the face, scalp, and lips. Local anesthesia may be necessary. Some pigment loss may occur. Lasers are effective for those using blood thinners or as a secondary treatment when other treatment methods have not been effective. Photodynamic therapy involves applying topical 5-aminolevulinic acid (5-ALA) to lesions, especially on the face and scalp. The medicated area is exposed to strong light that activates the 5-ALA. This treatment selectively destroys actinic keratoses and causes little damage to surrounding skin. Some temporary swelling and redness may occur. We encourage you to contact us if you would like to learn more about actinic keratosis treatment in Issaquah & Seattle and the options for treatment. Call 425-391-2500 to inquire about an appointment. 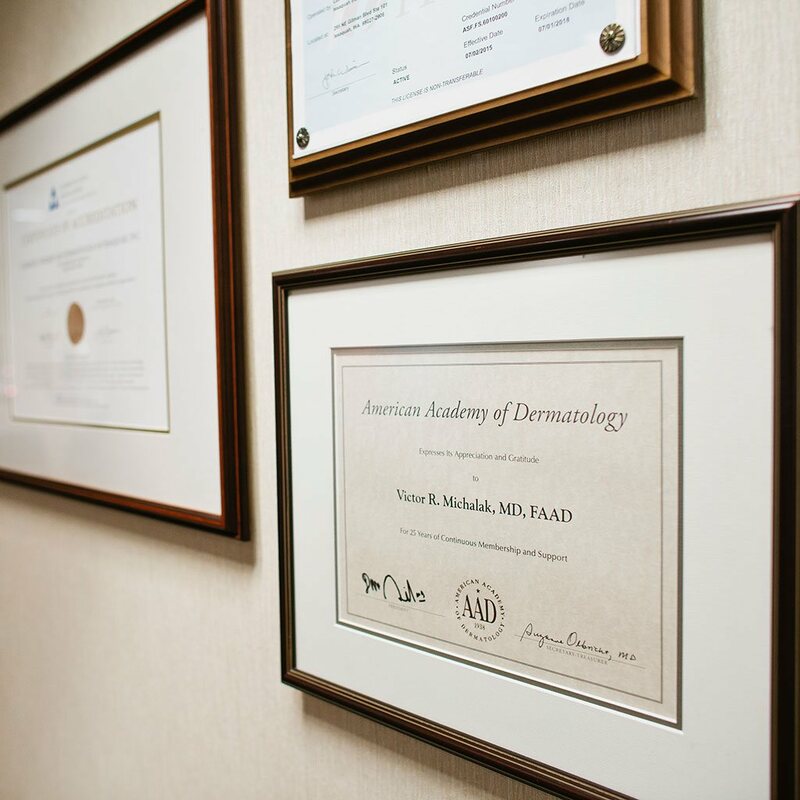 Our dermatology office is located in Issaquah, just outside of Seattle, Washington.